The sixty mile long valley of the Isonzo [Soca] River running from the Julian Alps south to the Adriatic Sea bisected the only practical area for offensive operations by the Italian Army during the Great War. Throughout most of the rest of the mountainous 400-mile length of the S-shaped Italian Front the dominating positions almost everywhere were in the hands of the Austro-Hungarian forces. A Delimitation Commission following the war of 1866 had intentionally given Austria a highly defensible frontier. But by attacking across the coastal plain east of the lower end of the River, they could, so judged Supreme Commander Luigi Cadorna, feasibly acquire a series of territorial objectives from Gorizia to Trieste down to the Dalmation Coast. Secondarily, further to the North they believed they could leap frog the mountains bracketing both sides of the River and strike a strategic blow against their opponent's rear. The Isonzo sector, however, presented its own difficult obstacles. The river itself was susceptible to flooding and the war years featured record rainfalls and snow melts. 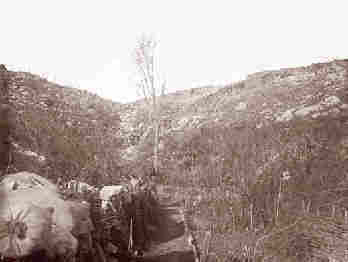 In the more mountainous northern sector of the Front a dilemma confronted the Italian high command which they never managed to resolve: To cross the river successfully, they needed to neutralize the forces atop the overlooking mountains; but to occupy those mountains, they had to cross the river first. The lower coastal zone seemed to present more possibilities for advancing, but it featured some peculiar geography that aided defending forces. These disadvantages combined with the Italian determination to achieve their expanisionist war aims plus the defensive skills of General Boroevic von Baojna, Commander of the Austro-Hungarian Fifth Army, would turn the Isonzo into one of the greatest killing zones of the First World War. Italy would suffer half of their 600,000 killed and Austria-Hungary would suffer 200,000 of their WWI total of 1.2 million dead along the Isonzo. Italian soldier and poet Giuseppe Ungaretti would later write: "The Isonzo scoured me like one of its stones." Since Italy knew war was coming, General Cadorna was able to mount a surprise opening offensive, known as Primo Sbalzo [the First Jump], in late May 1915 to improve his army's postion in selected sectors. In Northeast Italy he ordered an advance across the 1866 border to the banks of the Isonzo. The Second Italian Army under General Frugoni captured Caporetto [Kobarid] in the north and the mighty peak of Mte Krn [Mte Nero] beyond the Isonzo. In the south the Duke of Aosta's Third Army also advanced, but were confronted by enemy units deployed across the river before Gorizia and on its surrounding mountains, thus preventing a quick capture of that key city. Further south, springtime flooding around Montfalcone also hindered the advance. Attacks against Mte Krn, at the Tolmino bridgehead --- where Boroevic ordered costly counterattacks, Mte Kuk [Mte Cucco], Mte Sabatino and the Gorizia bridgehead all failed from lack of coordination and insufficient artillery support. Also, since the Austro-Hungarian Army had been at war for nearly a year, they were much more experienced at preparing defensive trenches, bunkers and barbed wire screeens. General Cadorna's two armies would dig along their new line and await units still mobilizing. The final skirmish of this preliminary phase involved a final, unsuccessful effort by the Italian Army from June 11th to the 17th to create their own bridgehead beween Gorizia and Tolmino. Within a few weeks Cadorna would have 35 divisions in the sector facing the 14 divisions of their opponent's 5th Army. 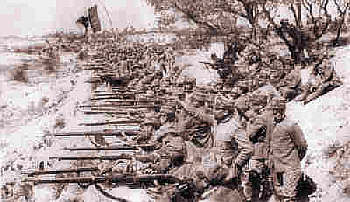 The First Battle of the Isonzo would begin with a week long artillery barrage from General Cadorna's forces on May 23, 1915. Four battles would be fought on this front in 1915, five in 1916 and two in 1917. Click on the icons below for the battles which interest you. Although some consider the the Battle of Caporetto to be the Twelveth Battle of the Isonzo, La Grande Guerra will treat it separately because of its unique character and the fact it was an offensive mounted by the Central Powers rather than Italy.